Want to make online marketing easier? 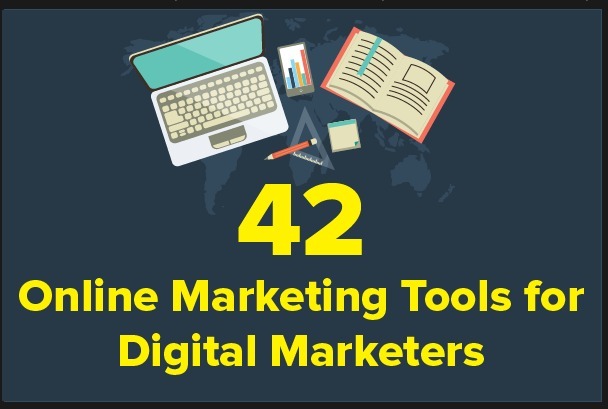 Online marketing tools for digital marketers help with many tedious, time-consuming tasks. With the ever-increasing number of channels to communicate with your customers, the more tools to simplify and streamline your online presence, the better. But when it comes to choosing a medium for your message, the decision becomes more dizzying. There’s social media marketing, search engine marketing and search engine optimization, to name only a few of the platforms to procure your digital marketing plan. What sites do you choose and which tactics work wonders? The choices are countless and that’s why EZSiteBuilders created an infographic to make sense of it all. 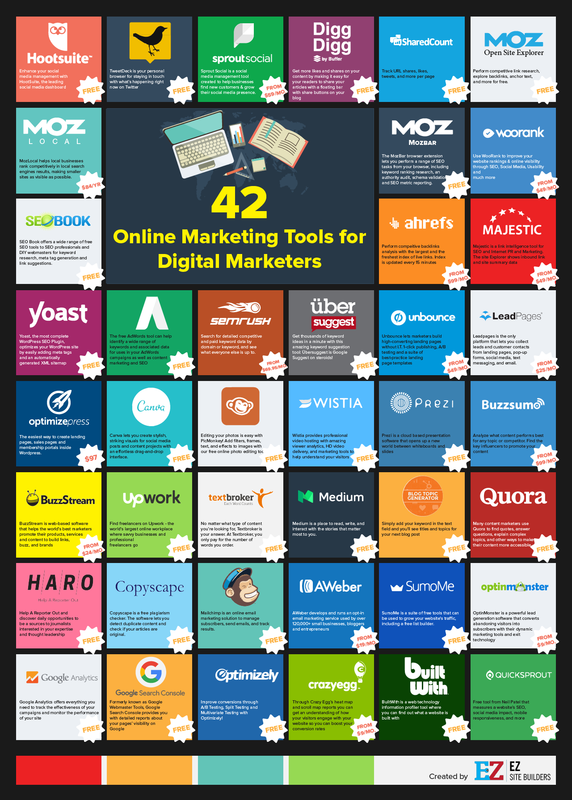 Lucky for you, we’ve summarized all 42 digital marketing tools below. Read on after the graphic! BuzzSumo – Analyze what content performs best for any topic or competitor. Find the key influencers to promote your content. Canva – Canva lets you create stylish, striking visuals for social media posts and content projects with an effortless drag-and-drop interface. Digg Digg – Get more likes and shares on your content by making it easy for your readers to share your articles with a floating bar with share buttons on your blog. Hootsuite – Enhance your social media management with HootSuite, the leading social media dashboard. QuickSprout – Free tool from Neil Patel that measures a website’s SEO, social media impact, mobile responsiveness, and more. SharedCount – Track URL shares, likes, tweets, and more per page. SproutSocial – Sprout Social is a social media management tool created to help businesses find new customers & grow their social media presence. TweetDeck – TweetDeck is your personal browser for staying in touch with what’s happening right now on Twitter. WooRank – Use WooRank to improve your website rankings & online visibility through SEO, Social Media, Usability and much more. Ahrefs – Perform compeitive backlinks analysis with the largest and the freshest index of live links. Index is updated every 15 minutes. Google Keyword Planner – The free AdWords tool can help identify a wide range of keywords and associated data for uses in your AdWords campaigns as well as content marketing and SEO. Majestic – Majestic is a link intelligence tool for SEO and Internet PR and Marketing. The site Explorer shows inbound link and site summary data. Moz Local – MozLocal helps local businesses rank competitively in local search engines results, making smaller sites as visible as possible. Moz Open Site Explorer – Perform competitive link research, explore backlinks, anchor text, and more for free. MozBar – The MozBar browser extension lets you perform a range of SEO tasks from your browser, including keyword ranking research, an authority audit, schema validation, and SEO metric reporting. SEM Rush – Search for detailed competitive and paid keyword data by domain or keyword, and see what everyone else is up to. SEO Book – SEO Book offers a wide range of free SEO tools to SEO professionals and DIY webmasters for keyword research, meta tag generation and link suggestions. TextBroker – No matter what type of content you’re looking for, Textbroker is your answer. At Textbroker, you only pay for the number of words you order. UberSuggest – Get thousands of keyword ideas in a minute with this amazing keyword suggestion tool: Übersuggest is Google Suggest on steroids! Unbounce – Unbounce lets marketers build high-converting landing pages without I.T. 1-click publishing, A/B testing and a suite of best-practice landing page templates. Upwork – Find freelancers on Upwork – the world’s largest online workplace where savvy businesses and professional freelancers go to work. Yoast – Yoast, the most complete WordPress SEO Plugin, optimizes your WordPress site by easily adding meta tags and an automatically generated XML sitemap. Optimizely – Improve conversions through A/B Testing, Split Testing and Multivariate Testing with Optimizely! OptimizePress – The easiest way to create landing pages, sales pages and membership portals inside WordPress. Have you joined my FREE content marketing mini-class yet? with space for journaling how you can apply it to your business. Copyscape – Copyscape is a free plagiarism checker. The software lets you detect duplicate content and check if your articles are original. CrazyEgg – Through Crazy Egg’s heat map and scroll map reports you can get an understanding of how your visitors engage with your website so you can boost your conversion rates. HARO – Help A Reporter Out and discover daily opportunities to be a sources to journalists interested in your expertise and thought leadership. Hubspot’s Blog Topic Generator – Simply add your keyword in the text field and you’ll see titles and topics for your next blog post. Leadpages – Leadpages is the only platform that lets you collect leads and customer contacts from landing pages, pop-up forms, social media, text messaging, and email. Medium – Medium is a place to read, write, and interact with the stories that matter most to you. OptinMonster – OptinMonster is a powerful lead generation software that converts abandoning visitors into subscribers with their dynamic marketing tools and exit technology. PicMonkey – Editing your photos is easy with PicMonkey! Add filters, frames, text, and effects to images with our free online photo editing tool! Prezi – Prezi is a cloud based presentation software that opens up a new world between whiteboards and slides. SumoMe – SumoMe is a suite of free tools that can be used to grow your website’s traffic, including a free list builder. Wistia – Wistia provides professional video hosting with amazing viewer analytics, HD video delivery, and marketing tools to help understand your visitors. Quora – Many content marketers use Quora to find quotes, answer questions, explain complex topics, and other ways to make their content more accessible. Aweber – AWeber develops and runs an opt-in email marketing service used by over 120,000+ small businesses, bloggers and entrepreneurs. Mailchimp – Mailchimp is an online email marketing solution to manage subscribers, send emails, and track results. BuiltWith – BuiltWith is a web technology information profiler tool where you can find out what a website is built with. Google Analytics – Google Analytics offers everything you need to track the effectiveness of your campaigns and monitor the performance of your site. Google Search Console – Formerly known as Google Webmaster Tools, Google Search Console provides you with detailed reports about your pages’ visibility on Google. Which of these helpful online marketing tools will you choose to simplify your marketing? Michael Peggs is the founder of Marccx Media, a digital marketing agency specializing in SEO and Content Marketing. Before Marcxx, Peggs worked at Google in business development, forming digital media and advertising partnerships. He is also a blogger and podcaster, hosting the iTunes Top 10 New & Noteworthy Podcast You University. Awesome list. I’d also add GetResponse. It’s a marketing automation tool with some more additional features. I think that all are nice tools, but I would like to include Apptivo in your list. What is your opinion about this marketing tool? Not one I’m familiar with, but they have some good reviews lately. Thanks! 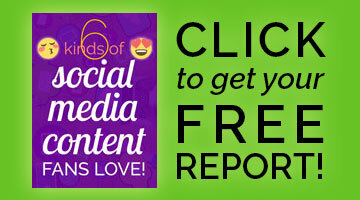 Hi there, I noticed that you are linking to Sharedcount.com on your article https://louisem.com/95461/online-marketing-tools . As that service is being discontinued, perhaps it could be useful to replace the link for Sharescount.com, a new working alternative. Keep up the great work! Thanks for the suggestion, but I see now that they’re not shutting down after all. Awesome list! I think the email marketing portion could really benefit from a data verification service like XVerify. Just a suggestion! I am using some of the tools which are listed here and knew the details of few but not using it. Few of the tools I didn’t come across even by reading the name, will check it now. I just saw this on Pinterest. Great content! Can’t wait to check each of them out. As a beginner, This is a very useful reference. Thanks!!! Glad this is useful to you, Franz!